This fourth article, which is part of the series on Linux device drivers, deals with the various concepts of character drivers and their implementation. Shweta at her hostel room in front of her PC, all set to explore the characters of Linux character drivers, before it is being taught in the class. She recalled the following lines from professor Gopi’s class: “… today’s first driver would be the template to any driver you write in Linux. Writing any specialized advanced driver is just a matter of what gets filled into its constructor & destructor. …”. With that, she took out the first driver code, and popped out various reference books to start writing a character driver on her own. She also downloaded the on-line “Linux Device Drivers” book by Jonathan Corbet, Alessandro Rubini, Greg Kroah-Hartman from http://lwn.net/Kernel/LDD3/. Here follows the summary from her various collations. We already know what are drivers and why we need them. Then, what is so special about character drivers? If we write drivers for byte-oriented operations or in the C-lingo the character-oriented operations, we refer to them as character drivers. And as the majority of devices are byte-oriented, the majority of device drivers are character device drivers. Take for example, serial drivers, audio drivers, video drivers, camera drivers, basic I/O drivers, …. In fact, all device drivers which are neither storage nor network device drivers are one form or the other form of character drivers. Let’s look into the commonalities of these character drivers and how Shweta wrote one of them. 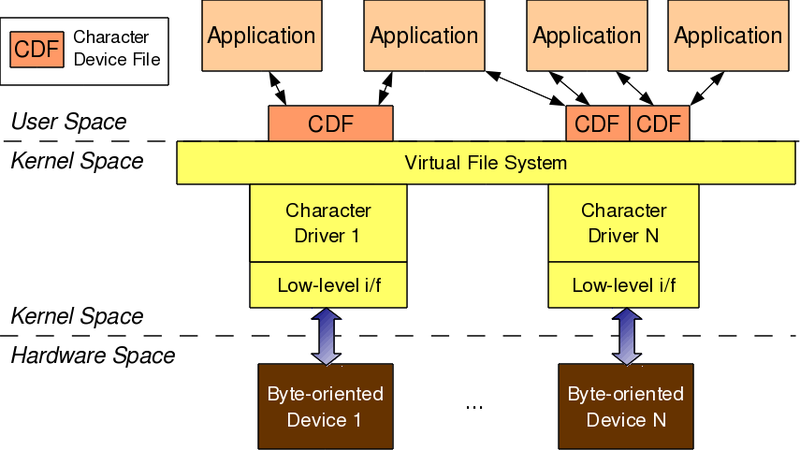 As shown in Figure 7, for any application (user space) to operate on a byte-oriented device (hardware space), it should use the corresponding character device driver (kernel space). And the character driver usage is done through the corresponding character device file(s), linked to it through the virtual file system (VFS). What it means is that an application does the usual file operations on the character device file – those operations are translated to the corresponding functions into the linked character device driver by the VFS – those functions then does the final low level access to the actual devices to achieve the desired results. Note that though the application does the usual file operations, their outcome may not be the usual ones. Rather, they would be as driven by the corresponding functions in the device driver. For example, a read followed by a write may not fetch what has been written into, unlike in the case of regular files. Note that this is the usual expected behaviour for device files. Let’s take an audio device file as an example. What we write into it is the audio data we want to playback, say through a speaker. However, the read would get us the audio data we are recording, say through a microphone. And the recorded data need not be the played back data. And the interesting thing is that, all of these can exist independently on a system, without the other being there. So, mere existence of these on a system doesn’t mean they are linked to form the complete connection. Rather, they need to be explicitly connected. Application gets connected to a device file by invoking open system call on the device file. Device file(s) are linked to the device driver by specific registrations by the driver. And the device driver is linked to a device by its device-specific low-level operations. Thus, forming the complete connection. With this, note that the character device file is not the actual device but just a placeholder for the actual device. First API registers the cnt number of device file numbers starting from first, with the name. Second API dynamically figures out a free major number and registers the cnt number of device file numbers starting from <the free major, firstminor>, with the name. 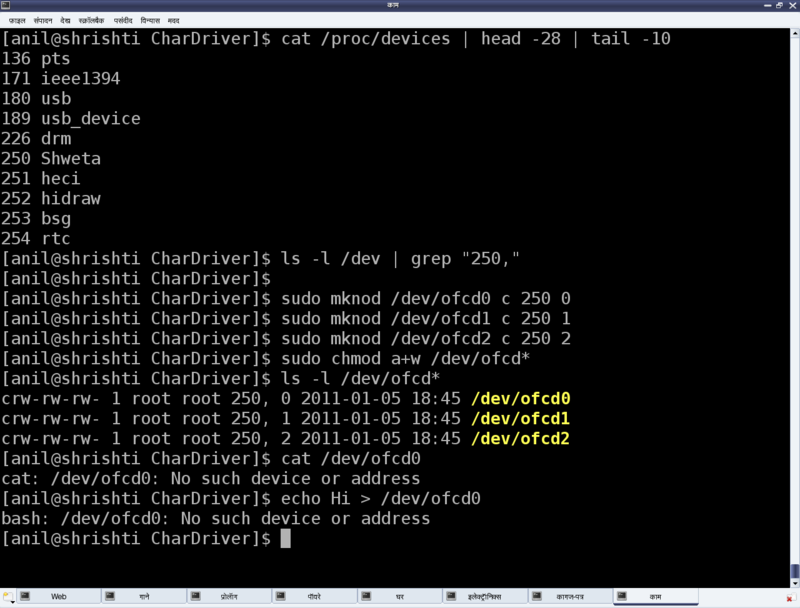 In either case, the /proc/devices kernel window lists the name with the registered major number. With this information, Shweta added the following into the first driver code. Additionally, before unloading the driver, she peeped into the kernel window /proc/devices to look for the registered major number with the name “Shweta” using cat /proc/devices. It was right there. But she couldn’t find any device file created under /dev with the same major number. So, she created them by hand using mknod, and then tried reading & writing those. Figure 8 shows all these. Please note that the major number “250” may vary from system to system based on the availability. Figure 8 also shows the results, Shweta got from reading & writing one of the device files. That reminded her that the second step for connecting the device file with the device driver – “Linking the device file operations to the device driver functions” is not yet done. She realized that she needs to dig further information to complete this step and also to figure out the reason for the missing device files under /dev. We shall continue further in our next article, to figure out what more is Shweta learning and how is she going ahead with her first character driver. This entry was posted in Linux Device Drivers and tagged Character Drivers, Device Drivers, LFY, Linux, OSFY on May 1, 2013 by Anil Kumar Pugalia. This fourth article of the mathematical journey through open source, takes you through the recursive functional power of bench calculator. Equipped with the fundamentals of programming functions, we are all set to jump into the spiral of recursion. Frankly speaking recursion is not a spiral, as many would like to see it as. It is more to do with the way our brain works. So, let’s look into it as our brain suggests. Any recursion fundamentally has two parts: the recursive relation and the termination condition(s). For mathematics, recursion is basically to do with functions. Now, the point is, as we all understand, if we try to expand these, they will continue for ever, unless we decide to stop at some decent condition. For example, n! = n * (n-1)! = n * (n-1) * (n-2)! = n * (n-1) * (n-2) * (n-3)! = … and so on. So, we decide and say that let’s stop it, when we reach 0, as we assume n to be positive. And hence, n! becomes n * (n-1) * (n-2) * … * 2 * 1 * 0!. And then we define 0! to be 1. This is called the termination condition. And, we would notice that, whenever there is a recursive relation, we would need one or more such termination conditions to stop the relation going forever. The number of termination conditions typically depend on the different lower orders, we have in the recursive relation. For example, factorial of n has just one lower order factorial of (n-1); exponent of x has again just one lower order exponent of (x/2); but Fibonacci of n has two lower orders Fibonacci of (n-1) and Fibonacci of (n-2). Hence, factorial and exponent would have one termination condition and Fibonacci would have two termination conditions. With all these, we have pretty much explored all the functionalities of the bench calculator, and if you are a programming geek, you may even do the next level of stuff with these. Next level stuff? Yes, I mean jumping to the next dimension, vectors, etc using arrays of bc. Aha! But isn’t there a way for non-programmers? Yes, there is octave. This entry was posted in Mathematics and tagged bc, Bench Calculator, LFY, Maths, OSFY, Recursion on May 1, 2013 by Anil Kumar Pugalia.